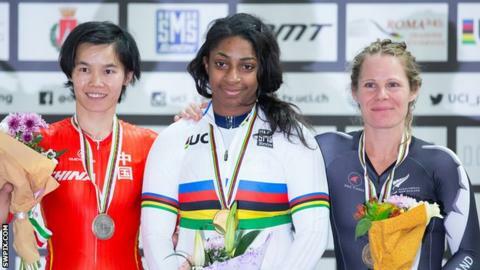 World champion Para-cyclist Kadeena Cox says she has more to learn in order to improve ahead of the Paralympics. Cox, 25, won gold and set a new C4 500m time trial world record in the UCI Para-cycling Track Worlds on 17 March. "I'm not at the top of my game as I'm still really new to it so there's lots to learn. There is more I can do in cycling," she told BBC Radio Leeds. "I didn't know how I was going to get on but it's 500m so I went out there and rode round twice like I always do." Cox was reclassified from the C2 to the C4 event just a day before competing in the Track Worlds, meaning she was racing against less-disabled riders, but set a world record time of 37.456 seconds on the way to winning gold. "I wasn't sure who was in the class because I've never had to look that high up," she added. "I didn't know what the competition was like but I knew it was going to be a lot stronger because they are more able." After also winning gold in the T37 100m at the IPC Athletics World Championships last October, Cox is hoping to be the first GB Para-athlete since Isabel Newstead, who was successful in shooting and athletics in Seoul 1988, to win medals in two sports at one Paralympic Games. She continued: "It's only been 10 months and I am still relatively new to cycling. I've had a great coach, John Norfolk, who has taken me from a novice to a great cyclist. "The preparations are different from athletics. It takes me a lot more to mentally prepare for cycling just because it's totally new and it's not something I'm very comfortable with yet. "I still think 'am I going to get out of the gate in time?' There's so much more to think about."